The BooleanUnion command trims the shared areas of selected polysurfaces or surfaces and creates a single polysurface from the unshared areas. Select the objects and press Enter. 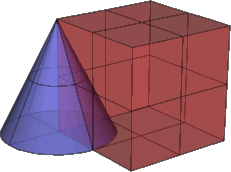 The objects combine into one polysurface. The BooleanDifference command trims the shared areas of selected polysurfaces or surfaces with another set of polysurfaces or surfaces. Select surfaces or polysurfaces to subtract from, and press Enter. Select surfaces or polysurfaces to subtract with, and press Enter. Rhino is a surface modeler. It's not possible to subtract a sphere inside another sphere to create a tennis ball-like object that has a solid wall enclosing a void. The BooleanIntersection command trims the unshared areas of selected polysurfaces or surfaces. Select the first set of objects or a set of intersecting objects and press Enter. If a first set of objects was selected, select the second set of objects and press Enter. The BooleanSplit command splits shared areas of selected polysurfaces or surfaces and creates separate polysurfaces from the shared and unshared parts. Select the first set of objects and press Enter. Select the cutting objects and press Enter. 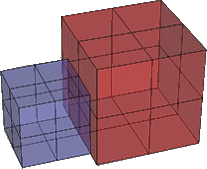 The cutting objects and the objects to split can be the same objects. Click the mouse in the viewport until you get the object you want. If the Boolean operation fails, text dots that indicate the area where there is a naked edge or a bad intersection are placed in the model. Search for these dots to examine the area causing the problem. Detailed information about the error is contained in the dot properties under Secondary text. For mesh objects the steps are the same as for the NURBS Boolean equivalent. The result of a command is always a mesh regardless of the input object type. Normals may not point the way you expect. Control points tend to stack up at the intersection of the two objects. Objects may have overlapping surface areas.